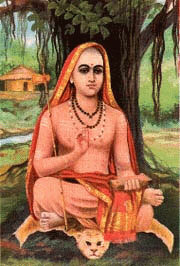 Sankara is considered the most important of Jnana Yoga Masters and Vedanta Teachers. Until today he is held in highest esteem. Chandra Cohen speaks on the importance of the most important Indian Philosopher and Jnana Yoga Master, Sankara, also called Sankaracharya, sometimes spelled Shankara or Shankaracharya. Sankara lived around 800 C.E. Listen to this talk on life, meaning and teaching of this Advaita Vedanta Master. Chandra is teaching Vedanta Courses at Yoga Vidya Germany and in upstate New Yoga. Chandra is a disciple of Swami Vishnu-devananda, Swami Brahmananda and Swami Dayananda. This short podcast episode is taken from an interview at Yoga Vidya Ashram Germany. This entry was posted in Uncategorized, vedanta-podcast and tagged chandra, jnana yoga, philosophy, sankara, sankaracarya, shankara, shankaracharya, vedanta by Sukadev. Bookmark the permalink.